Phantoms coach Slava Koulikov has hailed the impact of one forward line in putting the club’s season back on track. The trio of Milan Baranyk, Craig Scott and Marc Levers have been hugely impressive in recent weeks as the city team have left a miserable run of form behind them. Phantoms endured a run of six defeats in seven league games to see out 2015 and bring in the current year, surrendering a five-point cushion at the top of the English Premier League and sliding down the table in the process. 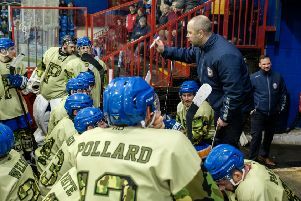 But they’re back in the winning groove now thanks to reaching the EPL Cup final and putting together a four-match league winning streak which came to a controversial end last Sunday during a deadlock and subsequent overtime loss against Guildford. Koulikov said: “Those guys have played together for the last three or four weeks and they have really clicked. “They have all come up with goals and assists, and their all-round contributions have been very good. “They have certainly been our most influential line and they deserve a lot of credit for the results we have been getting lately. Koulikov will need another set of top performances from his on-song trio when Phantoms face a ‘four-point’ clash at table-toppers Basingstoke this Saturday (6.30pm). Phantoms head to Hampshire for the two teams’ final meeting of the regular season two places and six points behind their hosts in the standings. They then entertain Hull at Planet Ice on Sunday night (5.30pm). Koulikov added: “Any game against two teams close to each other in the table is billed as a four-pointer at this stage of the season. “The game in Basingstoke will be very important for both teams and we know what to expect down there. “They will want to pull away more and we want to bring them back closer to us.